Oh to be a teenage nerd in 2013. When I was discovering movies I had to make do with Tron and The Dark Crystal. But to be able to fall in love with the movies by buying ticket after ticket to The Desolation of Smaug would be sheer fantasy heaven. The second film in The Hobbit trilogy is exciting in a way that the first isn’t. Maybe it’s just that I didn’t see it in distracting HFR (see sidebar), or maybe I was just more receptive this time. But where the first film felt plodding, this one feels adventurous. It’s cinema as spectacle. It’s fantastic and fun. The broad plot has to do with a company of dwarves — and one hobbit — setting out to reclaim a homeland that has been taken over by a dragon. The wizard Gandalf parts ways with the company, but he continues in a subplot to work toward the setup for the Lord of the Rings films. The big-picture plot allows for lots of little goal-based scenes and scenarios. Our merry band encounters a nest of giant spiders. They are taken hostage by a party of Elves, including Legolas. They make a fantastic escape in barrels, pursued by orcs. They hide out in Laketown looking for passage to the mountain beyond. 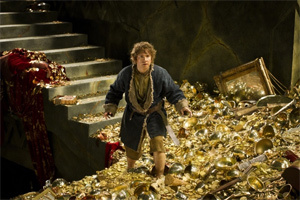 And yes, Bilbo is sent into the lair of the dragon Smaug to find a jewel taken from the dwarven homeland. In other words, there is plenty of room for adventure. There might have been room for bogging down in details, too, but Jackson finds the right balance. Granted, some scenes were mere conversations about plot points. I’m not sure I followed them, being too distracted by the hand-crafted details rendered in immersive 3-D. But I didn’t mind the distraction. I was in teenage nerd heaven. Compared to the first film, The Desolation of Smaug is even less of an actors’ movie. As dwarf King Thorin Oakenshield, Richard Armitage mostly expresses “determination.” As Bilbo, Martin Freeman is mostly dwarfed by the oversize adventure surrounding him. Even in his cat-and-mouse conversation with the dragon, Smaug’s mighty presence overwhelms any attention you might give to Freeman’s performance. Not surprisingly, the secondary characters get more of a chance to shine. I like Ken Stott’s comforting performance as Balin, the white-haired dwarf who comes across as experienced and down-to-(Middle)-Earth, without being a caricature of “wisdom.” Luke Evans gives a nice performance as the morally ambiguous Bard, the boatman who helps the dwarves sneak into Laketown. On the other hand, there are some characters like the giant-sized Beorn (Mikael Persbrandt) who adds little more than a scowl. Orlando Bloom gets to have the film’s most fun as the elf Legolas. He wryly grins as he jumps across wet dwarves to shoot, stab, and decapitate orc after orc. Legolas behaves more is more like a character from a video game than from literature. Of course the orcs are video-game villains too, infinitely replaceable and killable in one blow. If you take the video-game comparison as a criticism, you might also criticize how few women there are in this adventure. Only Tauriel (Evangeline Lilly), an elf, gets to shoot arrows with the boys. At least she can hold her own. For me, I don’t necessarily think the film would have been better had it been less like a testosterone-fueled video game. Maybe that’s what makes it fun. One of the most impressive special effects is the most common: a convincing sense of scale. Jackson has perfected the trick of showing Gandalf as always a size larger than the dwarves, and Beorn a size larger than Gandalf. When the dwarves sit around Beorn’s table, they need two hands to pick up the mugs. Whenever there’s a two-shot, the actors all look “normal,” but also two sizes different. But of course the most noticeable special effect is the impressive character Smaug, brought to believable life by the animators. You understand, without fanfare, the physiology and musculature that pulls Smaug’s face into a cunning smirk or stretches his throat as he inhales to breathe fire. More convincing than the facial animation is the sense of sheer mass you get whenever Smaug moves. Maybe it’s the treasure horde, each coin and cup individually rendered, grains of sand in a dune of gold. Perhaps it’s the 3-D: when Smaug is facing the camera, his body is “back there,” way off in the distance. Only Benedict Cumberbatch’s tenor voice seemed odd — it isn’t deep enough for a twenty-ton dragon, even if the serpentine tone fits. The props in the Lord of the Rings films were praised for being hand-crafted by New Zealand artisans. I never really appreciated them until The Desloation of Smaug. In the crowded interiors of Laketown (and in the Inn at the film’s opening), I was convinced that everything on screen was made by medieval craftsman. The piles of cloth, the heavy iron weapons, even the strange bowl of walnuts used as a pillow for a wounded visitor in Bard’s house seems to have its own weight, provenance, and history. These details are sure to make The Desloation of Smaug a repeat performer for teenage nerds. It’s the kind of fun yet serious adventure that’s likely to spawn a generation of movie-lovers like me.